I’m back! After being on vacation and then experiencing a few family concerns when we got back . . . life seems to be returning back to “normal” if I dare say. It feels good to be back in the kitchen again and sharing my recipes with you. This recipe is delightful! I personally think that it is restaurant-worthy and Beau even made a comment that these tacos tasted like they came out of one of our favorite Mexican hot spots. They taste fresh, have a bit of spice, and they have a nice smoky flavor (thank you chipotle peppers and cumin!). Despite the long list of ingredients, these come together quickly. It was a nice simple dinner for us, and it allowed me to use up some of that cabbage that showed up in my Bountiful Basket this week. Lucky for me I made the whole recipe so that Beau and I can eat them again tomorrow night. YUM! I can’t wait! Toss the cabbage, 1/4 cup of the cilantro, scallions, vinegar, 1 teaspoon of the oil, and 1/4 teaspoon salt in a bowl. In a separate bowl, combine the remaining tablespoon cilantro, mayonnaise, lime juice, chipotles, and garlic and season with salt and pepper to taste. Set both aside for serving. Combine the chili powder, coriander, cumin, 1/8 teaspoon salt, and 1/8 teaspoon pepper in a bowl. Pat the shrimp dry with paper towels, brush with the remaining tablespoon oil, and rub evenly with the spice mixture. Place shrimp on a preheated grill (gas, charcoal, or indoor . . . I used indoor since it snowed the day I made these). Cook shrimp approximately 2 minutes, and then flip and cook another 2 minutes or until done. Shrimp is done when it is completely pink and it curls up a bit. 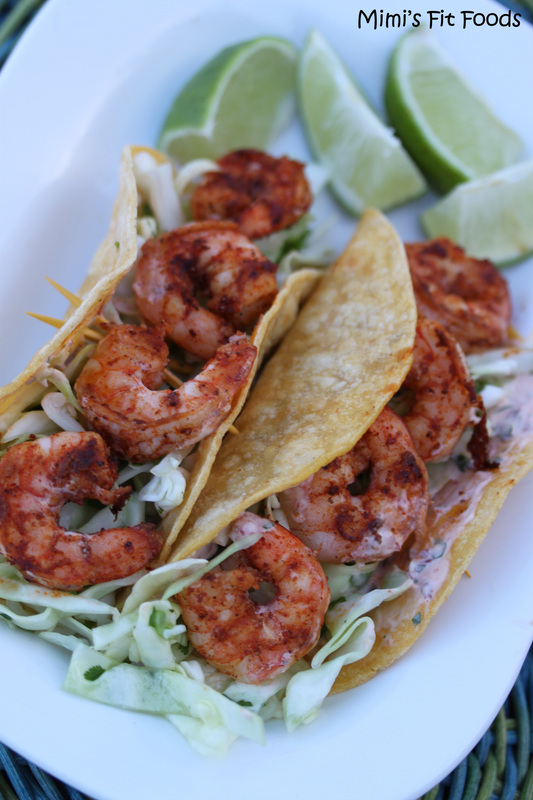 Remove shrimp from grill and loosely tent with aluminum foil, and let rest while grilling the tortillas. Working in batches, grill the tortillas, turning as needed, until warm and lightly charred, about 30 seconds. As the tortillas are done, wrap them in a clean kitchen towel or a large sheet of foil to keep them warm and soft. 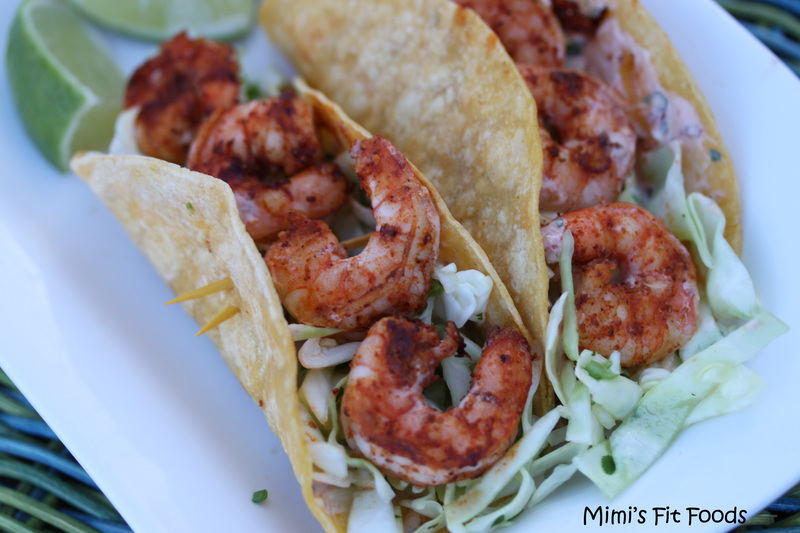 Smear each tortillas with 1/2 tablespoon mayonnaise mixture and top with some of the cabbage slaw and then shrimp. Serve with lime wedges. I just tried this for dinner tonight. Spicy (which I LOVE) and full of flavor. Going into my recipe box!